Steve Smith and David Warner who were serving a ban following the ball-tampering row, have been included in the Australian team for the World Cup 2019. The Australian squad for the mega event was announced on Monday where the team management had included the names of the two players who were missing out from the international teams since 2018. The fifteen-member squad will meet in Brisbane for the training camp from May 2, 2019. 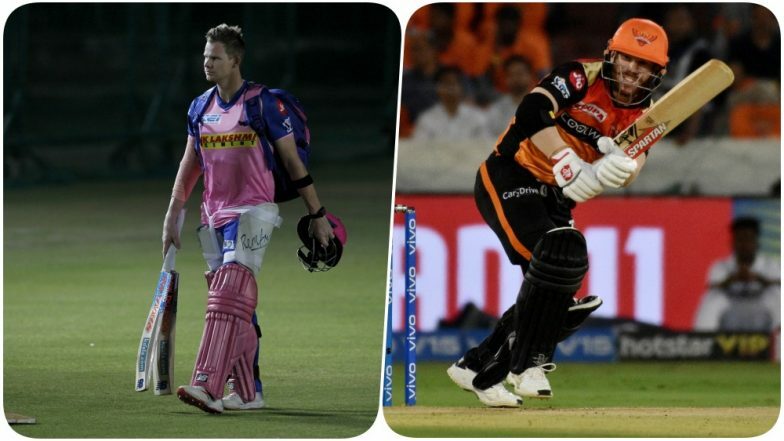 Both Steve Smith and David Warner are playing in the IPL 2019 for Rajasthan Royals and Sunrisers Hyderabad. Team India for ICC Cricket World Cup 2019: Twitterati Shocked With Vijay Shankar's Selection, Wanted Rishabh Pant in CWC19 Squad. Since the camp starts by May 2, Rajasthan Royals and Sunrisers Hyderabad will be absent for the knockout phases, which could prove to be a big blow for their respective franchises. “The fifteen-player squad for the ICC world cup will assemble in Brisbane for a training camp at the National Cricket Centre on May 2. The training camp will include three practice matches between Australia XI and New Zealand XI at Allan Border Field," Cricket Australia said in a statement. Smith and Warner Back for Australia's World Cup Defence. While David Warner has been in form and has scored runs in almost every match of the Sunrisers Hyderabad and remains the leading run-getter of the IPL 2019, Steve Smith is still struggling and is yet to get his Midas touch Warner has scored 400 runs from seven games, which also includes four half-centuries for the Sunrisers Hyderabad. Vijay Shankar Included in Team India for ICC Cricket World Cup 2019, Check Full 15-Man Squad.